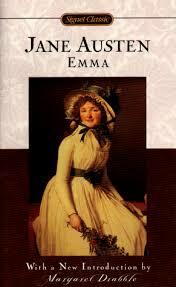 A summary essay on Emma by Jane Austen review the novel and examine the story revolving around the main character Emma. As the novel opens, Emma Woodhouse is returning from the wedding of her friend Miss Taylor. Since Emma is the one who introduced the happy couple, she decides to dedicate herself to matchmaking. Against the advice of her neighbor, Mr. Knightly, Emma plunges into the matchmaking business, attempting to fix up her new friend Harriet with the vicar, Mr. Elton. First, Emma persuades Harriet to break it off with Robert Martin, who has proposed. Next, Mr. Elton thinks that Emma is the one interested in her, and proposes to her. When she refuses, he departs for Bath, returning with a new wife and crushing the hopes of Harriet. Emma then decides that Jane and Mr. Dixon make a perfect match, confiding her suspicions to Frank, with whom Emma is falling in love. At the ball, everyone appears to be in love with everyone else, and Emma winds up insulting Miss Bates. When Emma goes and apologizes to Miss Bates, Mr. Knightly is impressed by her display of character. Frank’s aunt dies, leaving him free to marry Jane, who has told Emma where to get off. Emma thinks that all of this news will destroy Harriet, who confesses that, in fact, she is in love with Mr. Knightly. This makes Emma realize that she wants to marry Mr. Knightly. Mr. Knightly proposes to Emma, Robert Martin proposes a second time to Harriet, and everyone lives happily ever after. Jane Austen research papers examine her life and best known works. Women in Pride and Prejudice - Women in Pride and Prejudice research papers examine the role of the women in the novel. Custom research papers on the 19th Century women of Austen's era. Symbolism in Emma - As one of the most profound female writers in history, Jane Austen has provided the world with numerous tales of female growth and development, coming of age in a world where they are so often rebuked for having a thought or mind of their own. Symbolism in Pride and Prejudice - In her beloved novel, "Pride and Prejudice", Jane Austen did not heavily employ symbolism to represent abstract concepts or ideas. Symbolism in Jane Eyre - While books are written with specific intentions, often times there are more to the words on the page. Symbolism in Little Women - In her novel Little Women, Louisa May Alcott employed symbolism to explore society's treatment of men and women. Literary Characters - Literary Characters research papers overview characters and how they are a necessary catalysts that drive a story to it’s ultimate potential. Pride and Prejudice Themes - Essays on Pride and Prejudice Themes discuss Jane Austen’s story and discuss marriage, social class, economics, and self-knowledge seen throughout the book. Romanticism in Literature - Custom romanticism in literature research papers from Paper Masters custom written on the romantic writers of the 18th and 19th Centuries. British Literature - British Literature Research Papers look at a sample of an order placed on choosing one of the six topics to write on and gives detail about topics. Darcy in Pride and Prejudice - Darcy is the second most important character in Jane Austen's novel Pride and Prejudice. Elizabeth and Darcy in Pride and Prejudice - Pride and Prejudice research papers show that although the closure of the narrative in Jane Austen’s Pride and Prejudice is the happy marriage of both Elizabeth Bennet and Jane. Pride and Prejudice Summary - A summary on Pride and Prejudice examines the story about the five Bennet daughters, as they try to make their way through the world, most of which involves marrying the right man. Sense and Sensibility by Jane Austen depicts a social life that is a collision between linear concerns and later concerns. Paper Masters writes custom research papers on Emma by Jane Austen summary and review the novel and examine the story revolving around the main character Emma.